Moto Morini Parking Only. London Street Sign Style Sticker. 3", 6" or 12". 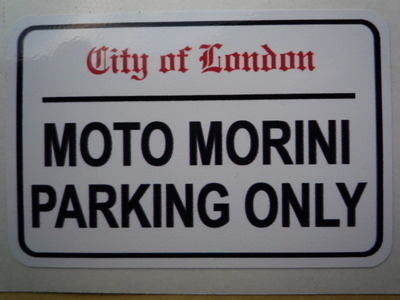 A City of London style, self adhesive 'Moto Morini Parking Only' sticker. Black, Red & White in colour. 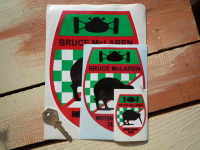 Available as either a 3" sticker for £1.99 (sticker measures approximately 75mm by 50mm), a 6" sticker for £2.99 (150mm by 100mm) or a 12" sticker for £6.99 (300mm by 200mm). 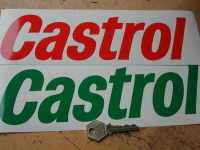 Printed Curved Front Scooter or Motorcycle Number Plate Sticker. 300mm. 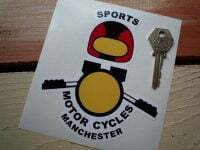 Sports Motorcycles Manchester Shaped Sticker. 3" or 5". 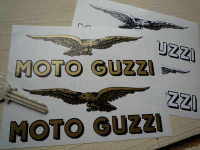 Moto Guzzi Text & Soaring Eagle Cut to Shape Stickers. 3", 4", 5", 6", or 7" Pair. Honda 70's Style Wing Stickers. Yellow, Black & White. 2", 3", 4", 5", or 6" Pair.